I understand the appeal of soccer. There are elements of tribe pride, athletic endurance, and brutally fierce competition that add up to an awesome experience. The sport is essentially dead here in the U.S., but practically every other country in the world goes berserk for a bunch of dudes chasing a ball around an open field. Go visit Europe during the World Cup, for example, and you’ll see evidence of that. If soccer wants to take North America by storm, simply bring us Moto Ball. 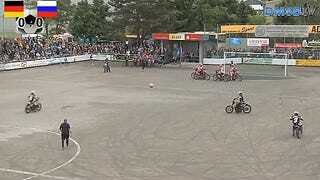 Moto Ball is played quite similarly to soccer, except the pitch can occasionally be concrete or blacktop, the ball is about twice as large as a soccer ball, and the players are all on 250cc dirtbikes. Because of the addition of motorized conveyance for all players save the goalkeeper, the action is a little more fast paced, and the scoring tends to happen a bit quicker. That’s what soccer is missing. Speed is what the sport needs to capture the attention and possibly the love of American sport fans. With traditionally American football running out of steam in recent years, maybe a case could be made for motorizing that other football sport to make it more fun, and hellishly dangerous. The sport is still a fringe niche kind of thing for most of Europe, but teams can be found in every major European nation. France, for example, sanctions Moto Ball through the FFM and has 13 official Moto Ball Clubs. Other teams can be found in Germany and Belarus—which played each other in the 2017 European Championship game, which you can watch highlights of below. Unlike soccer, which requires a dedicated stadium for fans to not gather in, Moto Ball can be played basically anywhere there is a wide open parking lot or field, which are things America has a whole lot of. With some temporary bleachers, fencing, soccer goals, and a gaggle of motorcycles and two-stroke oil by the barrel, you’ve got yourself a game. I could easily see this fitting in well at a dirt track race weekend if the infield can accommodate such. My fellow Americans, let’s make it happen.